Osteomas of facial bones are benign osteogenic tumors characterized by the proliferation of compact or cancellous bone. They originate from the craniomaxillofacial region such as temporal bones, sinuses or jaws. They usually occur between 2 nd and 5 th decade; however, may be seen at any age. There are three subtypes of osteomas; peripheral (parosteal, periosteal or exophytic), central (endosteal) and extraskeletal (osseous choristoma) osteoma. , Peripheral osteoma arises centrifugally from the periosteum; however, central osteoma arises centripetally from the endosteum. Extraskeletal soft tissue osteoma often originates from muscle tissue. Peripheral osteoma is a rare entity and most frequently arises from paranasal sinuses. The less often sites that a peripheral osteoma may arise from are orbital wall, temporal bone, pterygoid process and external ear canal. The prevalence of peripheral osteoma at jaw bones is quite rare and if occurs, lesions are most commonly seen at the mandible. The purpose of this case report is to present a solitary peripheral mandibular osteoma with radiographic findings and to discuss differential diagnosis with relevant literature. The case we present here is a 19-year-old female patient who was referred to our clinic with a complaint of 3 monthly painless swelling on the right side of her face. On physical examination, non-pulsatile, non-tender, approximately 1 cm sized, hard mass was palpated at the buccal surface of the mandible. The overlying mucosa of the mass was normal in color and was not attached to the underlying mass. There was no prior history of facial trauma. A solitary, well-defined, round, 11 mm × 10 mm sized hyperdense lesion at the lower border of the body of the mandible was detected with computed tomography (CT) [Figure 1]. The mass had a similar density to the adjacent bone structure. On the basis of physical and radiographic examination, osteoma of the mandible was considered as initial diagnosis. Excision was performed under local anesthesia with extraoral approach and the mass was excised with a chisel and mallet. The marginal mandibular branch of the facial nerve was preserved during surgery. Macroscopically, yellowish solid mass of about 1 cm in diameter was visualized [Figure 2]. Patient was discharged without any complications. 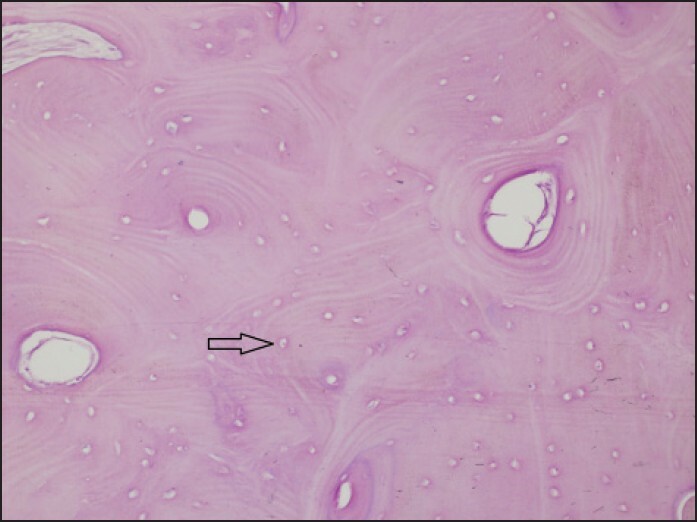 The histopathological study findings were consistent with osteoma [Figure 3]. The suspicion for Gardner syndrome rises with a facial osteoma detection. Gardner syndrome may present with rectal bleeding, diarrhea and abdominal pain and characterized with colorectal polyposis, multiple osteoma, skin and soft tissue tumors, multiple impacted or supernumerary teeth. Patients with colorectal poliposis with accompanying osteoma should be evaluated for Gardner syndrome as the intestinal polyps in Gardner syndrome are predominantly adenoma and the risk for malign progression is 100%. Therefore, patients with colorectal polyposis and facial osteoma should be evaluated with colonoscopy and colorectal carcinoma must be excluded as early evaluation may improve prognosis of these patients. In our case, Gardner syndrome was not considered due to the absence of accompanying lesions. Osteomas are usually discovered incidentally at radiological examinations. If they become symptomatic, diagnosis can be made with physical examination and radiological imaging. Panoramic radiography and CT can be used for the imaging. But, CT is very useful for detection of the location and extension of the mass and also guidance for surgery. On CT images, peripheral osteomas are well-demarcated, round or oval mushroom-like hyperdense masses. Sessile lesions are often attached to the cortex with a broad base, whereas, pedunculated lesions have a thin contact area with compact bone. In our case, well-defined, rounded, hyperdense solitary mass at the lower border of the body of the mandible was detected with CT. Lesion density was similar to the adjacent bone density, so it was primarily thought to be an osteoma. 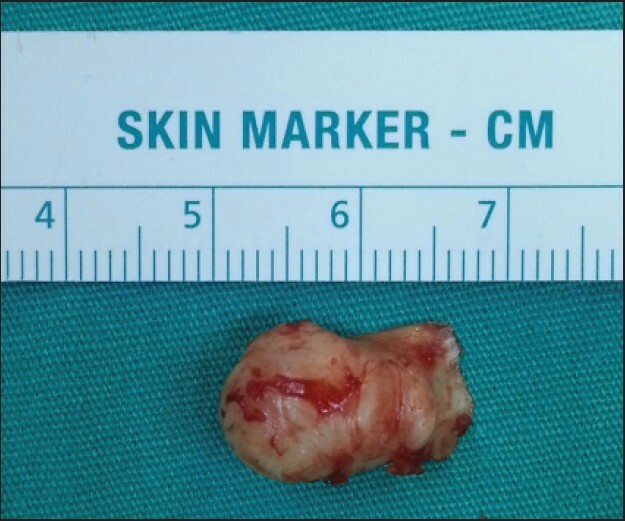 The surgical removal of asymptomatic peripheral osteoma is not generally necessary. Asymptomatic, small, non-progressing soliter osteomas can be just followed-up with physical and radiological examinations. However, surgical removal is indicated only large, deforming and progresif osteomas to cause facial asymmetry or functional malfunction. Extraoral approach is preferred for larger tumors that located posterior of the mandible. Recurrence after resection is very rare and malignant transformation has not been reported in the literature. In our case, extraoral approach was preferred due to the location of the lesion. The marginal mandibular branch of the facial nerve was preserved during surgery. Surgical intervention was completed without any complications. We presented radiological findings of an osteoma on the buccal surface of the body of the mandible with literature review. As shown in our report, CT is a very useful modality for both detection of location and extension of osteomas. Furthermore, osteomas of the facial skeleton may be associated with Gardner's syndrome. Therefore, patients with osteoma of the facial skeleton should be evaluated for the colorectal carcinoma because early and advanced evaluation is very significant for the prognosis of the patient. 1. Iwai T, Izumi T, Baba J, Maegawa J, Mitsudo K, Tohnai I. Peripheral osteoma of the mandibular notch: Report of a case. Iran J Radiol 2013;10:74-6. 2. Alves N, Oliveria RJ, Deana NF, Freitas NM. Peripheral osteoma in the ramus of mandible: Report of case. Int J Odontostomatol 2011;5:215-9. 3. Shakya H. Peripheral osteoma of the mandible. J Clin Imaging Sci 2011;1:56. 4. Bulut E, Acikgoz A, Ozan B, Gunhan O. Large peripheral osteoma of the mandible: A case report. Int J Dent 2010;2010:834761. 5. Kaplan I, Calderon S, Buchner A. Peripheral osteoma of the mandible: A study of 10 new cases and analysis of the literature. J Oral Maxillofac Surg 1994;52:467-70. 6. Schulze D. Radiographic diagnostics: Osteoma of the left mandibular notch. Quintessence Int 2008;39:702-3. 7. Sekerci AE, Sahman H, Ertas ET, Sisman Y. 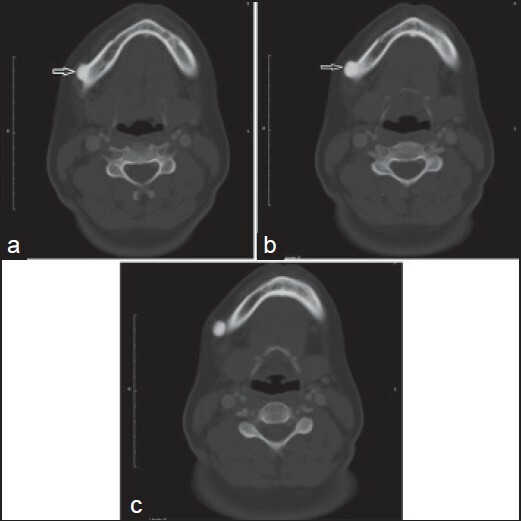 An unsual peripheral osteoma of the mandibular notch: A case report with computed tomography evaluation. Oral Radiol 2011;27:78-82. 8. Bessho K, Murakami K, Iizuka T, Ono T. Osteoma in mandibular condyle. Int J Oral Maxillofac Surg 1987;16:372-5. 9. Agrawal SM, Barodiya A, Agrawal MG. Ossifying fibroma of mandible: a case report. Natl J Dent Sci Res 2012;1:10-3. 10. Bokhari K, Hameed MS, Ajmal M, Togoo RA. Benign osteoblastoma involving maxilla: A case report and review of the literature. Case Rep Dent 2012;2012:351241. 11. White SC, Pharoah MJ. Benign tumors of the jaws. In: Oral Radiology; Principles and Interpretation. Ch. 21. St. Louis, Mo, USA: Mosby; 2004. p. 410-57.